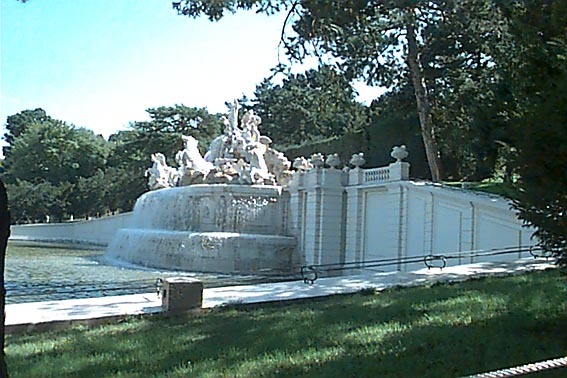 Vienna, city of Sissi and Strauss, waltzes and prancing Lippizaner, located on the shores of the blue Danube. A modern city where the past still lives on. In the music, the majestic palaces and the many churches. We were there four days. Only four days to discover this city which has centuries of history to offer. To me, Austria is the land of mountains where the Alps point their snowy peaks up in the sky. Imagine my disappointment when landing at Vienna Airport and only finding gently rolling hills. A quick check of the atlas told me why. 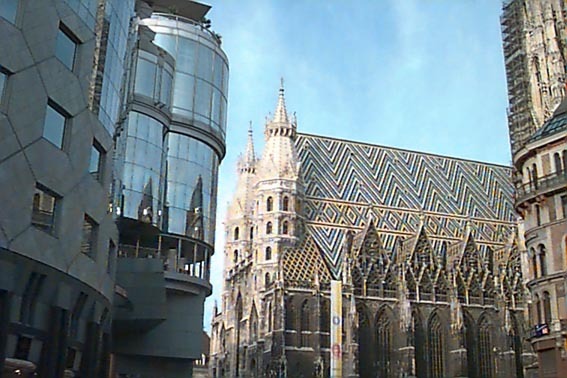 Vienna is located between the foothills of the Alps and the Carpathians, on the banks of the Danube that cut a path through the mountains. 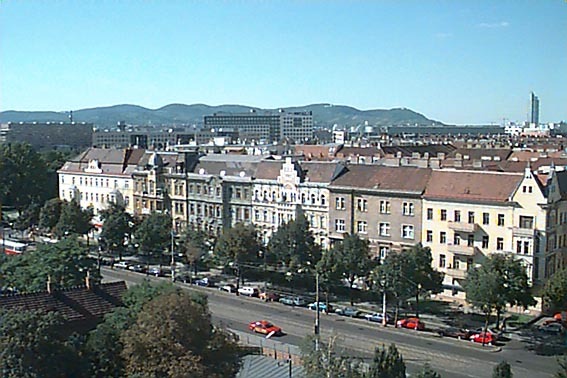 The airport isn't far from the city and a short while later a taxi delivered us at the door of a small but stylish hotel in the seventh district of Vienna. We quickly checked in and, still having most of the afternoon ahead, decided to start our explorations right away. 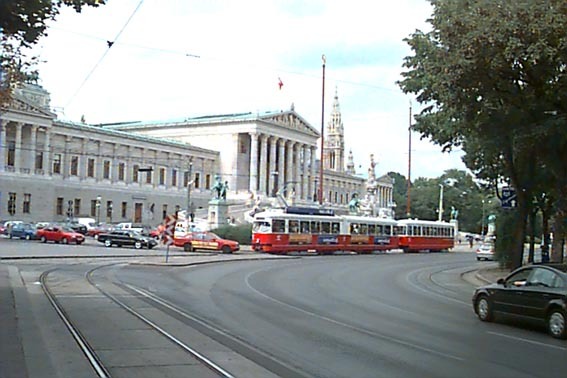 A short walk took us onto the museum grounds where on the one hand we had the Kunsthistorisches Museum, on the other the Naturhistorisches Museum (photo 1). The roar of traffic was left behind and a couple of music students sat on the steps playing, very appropriately, classical music. It wasn't difficult to imagine a horse-drawn coach pulling up and liveried servants helping the passengers from the carriage. 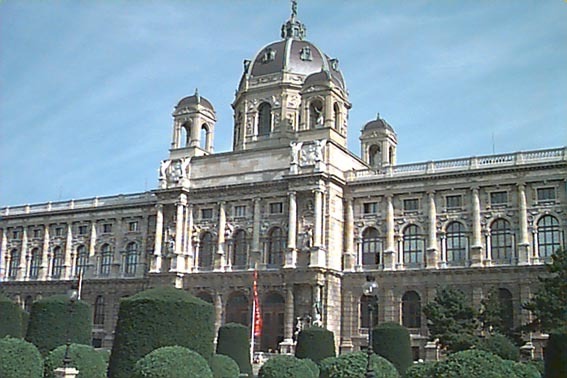 We walked on, past the immense Hofburg (the Imperial Palace that consists of several buildings) where horses and carriages are vying for the tourist trade and offer sightseeing tours, to end up on the Stephansplatz, in front of the famous cathedral, the Stephan's Dome (photo 2). The dome was open to the public so we entered to admire the interior (photo 3) as well as the exterior. Parts of this Gothic building date back to the 1100's. 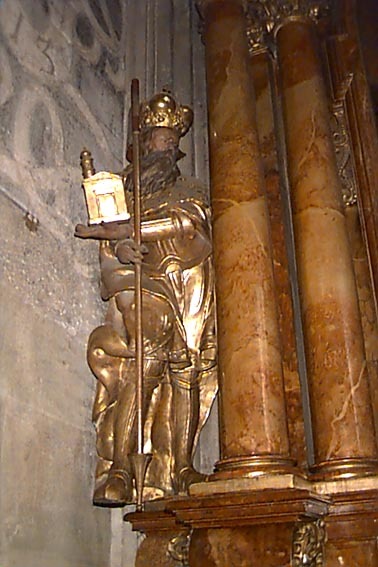 Over the centuries, (parts of) the cathedral have been destroyed in wars or fires, and been rebuilt. The following morning we went for a citywalk 'off the beaten path'. 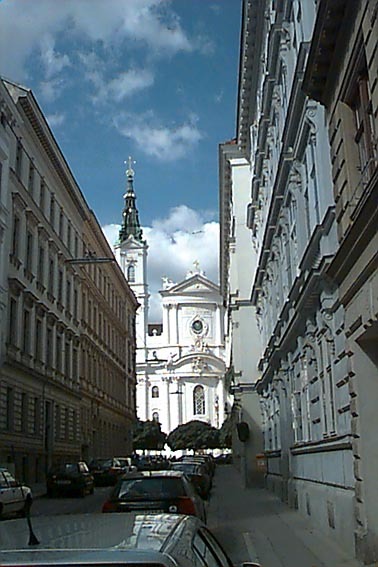 It led us past the Maria Kirche (photo 4) that used to host an orphanage. We drank morning coffee on a streetside terrace in front of this church and walked through a small, nameless park. 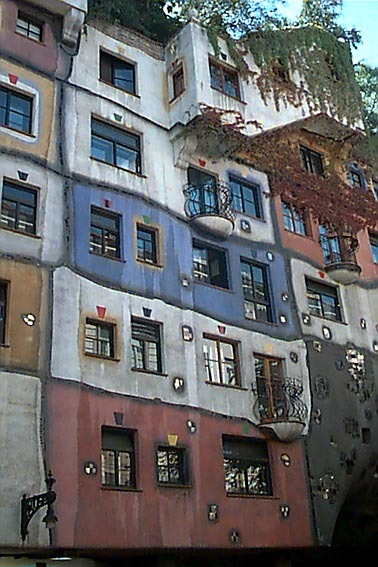 Once done with our walk, we took the subway to another part of the town and sought out the Hundertwasserhaus (photo 5). Friedensreich Hundertwasser was a famous Viennese architect and painter who died recently. His work is reminiscent of the Secession movement of the late 19th century. Since the house itself is a residential building, the authorities built another complex across the street in the same style to accommodate the tourists. 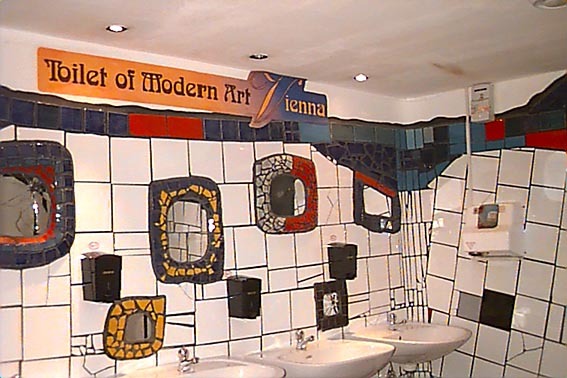 Aside from various souvernir shops and cafe's you can find the Toilet of Modern Art (photo 6) in this building. Of course we couldn't miss out on seeing the famous Danube river (photo 7). But it was a bit of a disappointment. 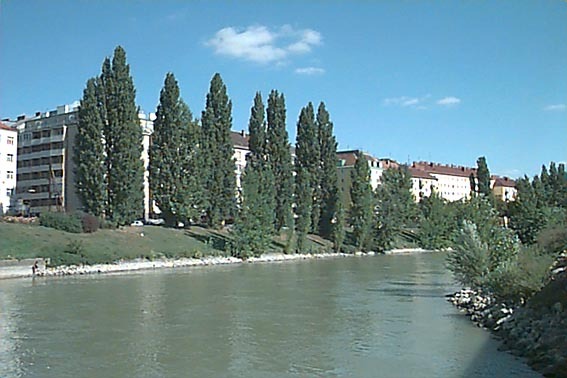 A large section of the river has been canalized in the 19th century. And contrary to the song, it also isn't very blue! Another thing one can't miss is the Prater, a year-round fair that hosts lots of amusement park attractions. We walked briefly along the attractions before deciding to try out one of the 'upsidedown' rollercoasters. The sky was very blue and the ground came up hard, which is all I remember from the ride. No, getting a bird's eye view from one of the Ferris wheels (photo 8) is a much better way to spent a few Schilling in the Prater. 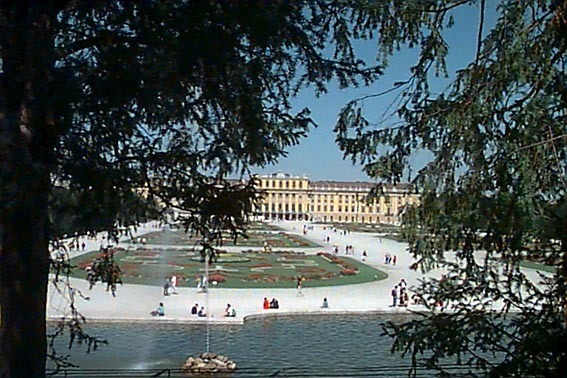 Our third day in Vienna (a Sunday) was for the most part spent in and around Schönbrunn (photo 9), the former summer residence of the Habsburgs. 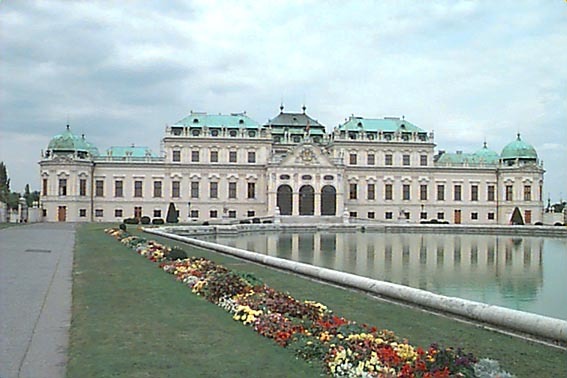 It's an immense palace with rooms decorated in Rococo style set on large grounds. Parts of this palace are open to the public. 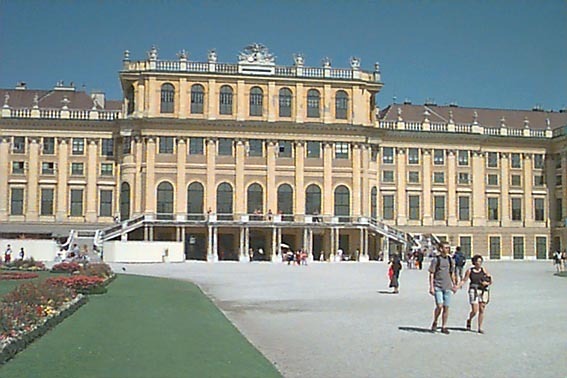 Unfortunately, due to the large groups of visiting tourists, it was virtually impossible to get a good look at the rooms and furniture that were once home to Empress Elizabeth of the 'Sissi'-movies, let alone get a taste on what it must have been like to live here! A stroll in the large, formal garden (photos 10 and 11) toward the hill at the back end was much more pleasant, especially considering the warm summer weather. 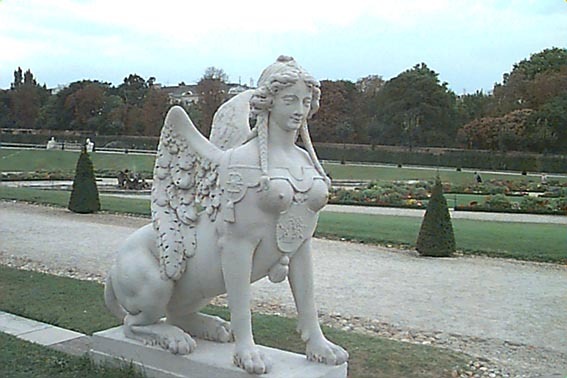 Plus the garden is so big that it can accommodate large quantities of tourists before becoming crowded. We took the subway back to the inner city where our group split up. A few of us went into the Stephan's Dome to take part in the tour of the dungeons. It is basically a huge burial vault with several chambers and levels, where even nowadays the church buries its departed bishops and other dignitaries. During the tour we also learned how the Viennese cared for their dead in days past... I won't give the details away here. Let me just say that it's not a suitable trip for the faint-hearted but when you can stomach it, it is very interesting indeed. On our fourth and last day we did, of course, more sightseeing. 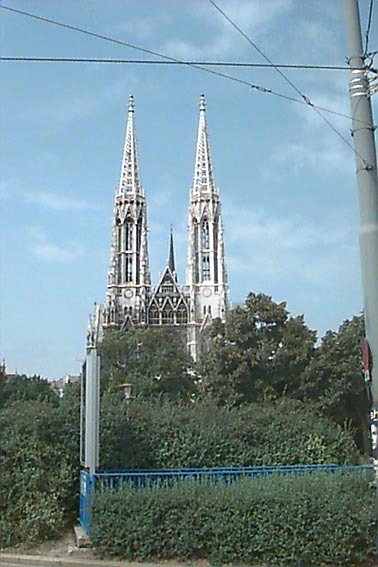 The Votiv Kirche (photo 12), a pseudo-Gothic building, was erected by Emperor Francis Joseph out of gratitude for escaping an assassination attempt in 1853. 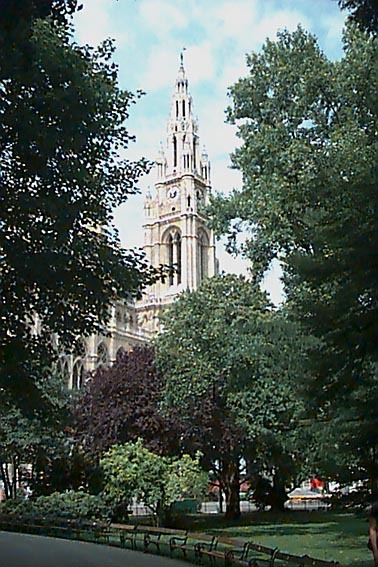 The Rathaus (photo 13), is neo-Flemish-Gothic with Renaissance touches. Both buildings are located along the Ring, just like the Parliament house (photo 14). The main mode of transport along the Ring is the 'Strassenbahn' (photo 14).